Donald Trump, the relentless Twitter critic of the 2016 presidential campaign, has set his sights on conservative pundits Erick Erickson and Glenn Beck. On Thursday, Trump tweeted that Erickson had been "fired like a dog" from RedState, the right-wing commentary website he founded over a decade ago. Erickson, a radio host and Fox News contributor, announced earlier this week that he would be leaving RedState, but attributed his departure to the site's acquisition by Salem Communications, which competes with Erickson's current radio broadcaster, Cox Media Group. Trump didn't buy that explanation: "If you read his tweets, you'll understand why [he was fired]," Trump wrote. "[He] just doesn't have IT!" Erickson shot back by making light of the attack: "Wow. Donald Trump lives in a universe where even dogs are fired," he wrote, later adding that Trump had his facts wrong. Moments before attacking Erickson, Trump went after Glenn Beck, the media entrepreneur and tea party hero who has been one of Trump's most frequent critics. In a New York Times article published Wednesday, Beck called Trump a "schoolyard bully who does not reflect any of the values and principles that I see from Americans on both sides." Erickson and Beck weren't Trump's only media targets this week. On Wednesday, Trump went after the "dishonest" "clowns" at Politico. "I wonder why somebody doesn't do something about the clowns at Politico and their totally dishonest reporting," Trump tweeted. "Politico has no power, but so dishonest!" Politico responded by sending Trump a link to it story on "The 199 Most Donald Trump Things Donald Trump Has Ever Said," and asked if that's what had made him so upset. 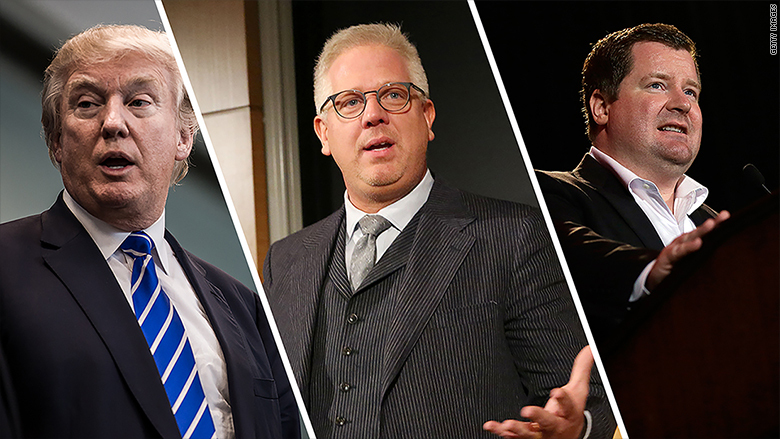 Related: Glenn Beck: Why do conservative pundits support Trump? But true to his bruise 'em and lose 'em style, Trump had already moved on to other targets just minutes after blasting Erickson and Beck. When Rep. Kevin McCarthy announced early Thursday afternoon that he was dropping out of the running for House Speaker, Trump weighed in gleefully: "Great, Kevin McCarthy drops out of SPEAKER race. We need a really smart and really tough person to take over this very important job!" he wrote.